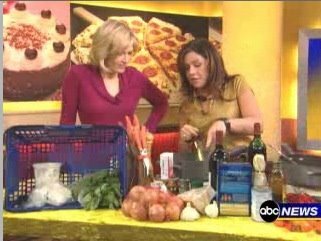 Rachael Ray was on Good Morning America this morning for an almost six-minute long segment with Diane Sawyer about her newest cookbook, Express Lane Meals. She quickly showed three recipes from the new cookbook: (1) Not-sagna Pasta Toss, (2) Bacon-Wrapped Halibut With Seared Cherry Tomato Sauce and Smashed Peas, and (3)Which Came First? Chicken and Egg Sammies Deluxe. She also spent a fair amount of time on the concept of the book, describing how she keeps certain things on hand all the time, then makes a quick trip to the grocery store for a few fresh items for each recipe. I am really looking forward to getting my copy to try it for myself.